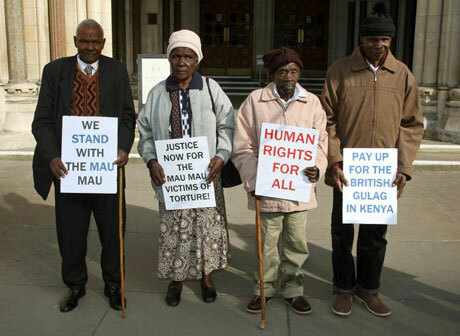 After struggles that have taken years to resolve, the British government is paying compensation to thousands of Kenyans tortured by their colonial occupation forces in the 1950’s. Known as the Mau Mau rebellion after the name given to the Kenya Land and Freedom Army (KLFA), it was a long struggle to gain freedom from British imperialist rule, and thousands were killed, injured and tortured. The Kenya Human Rights Commission estimates that over 90,000 were tortured, maimed or executed, and an additional 160,000 were subject to inhumane detention. As seen by these recent events, the legacy of imperialism still remains to be struggled against. “He said the UK government recognised Kenyans were tortured and it “sincerely regrets” the abuses that took place. A lawyer for the victims said they “at last have the recognition and justice they have sought for many years”. Thousands of people were killed during the Mau Mau revolt against British rule in Kenya in the 1950s. Mr Hague also announced plans to support the construction of a permanent memorial to the victims in the Kenyan capital, Nairobi. “I would like to make clear now, and for the first time, on behalf of Her Majesty’s government, that we understand the pain and grievance felt by those who were involved in the events of the emergency in Kenya,” he told the Commons. “The British government recognises that Kenyans were subject to torture and other forms of ill-treatment at the hands of the colonial administration. “The compensation amounts to about £3,000 per victim and applies only to the living survivors of the abuses that took place. Mr Hague said Britain still did not accept it was legally liable for the actions of what was a colonial administration in Kenya. Christian Turner, the British High Commissioner to Kenya, also made a statement on the settlement to members of the Mau Mau War Veterans’ Association in Nairobi. Gitu wa Kahengeri, secretary-general of the association, said it was the “beginning of reconciliation between the Mau Mau freedom fighters of Kenya and the British government”. “…Bryan Cox, who is representing Tandem Law, said there were “thousands” of further claims that remain unresolved and “the matter was far from over”. He said the law firm was working with more than 8,000 Kenyans who were still awaiting an agreement with the UK government. The UK has argued that all liabilities for the torture by colonial authorities was transferred to the Kenyan Republic upon independence in 1963 and that it could not be held liable now. But in 2011, the High Court in London ruled that four claimants did have “arguable cases in law”. “Speaking to the media in Nanyuki town yesterday, they said enough research was not done to establish the exact number of people who should have been compensated. One of the fighters, Mathenge Mugweru said Mau Mau members who were either killed or maimed during the struggle for independence exceeded six million. “I do not know what methodology they used to come up with that figure,” said Mugweru.The freedom fighters said the money being given as compensation is too little compared to what they lost during the struggle. The capitalist-imperialist system of law and justice is set up to serve the oppressors and not its victims. Occasionally there are openings in that system to give some sense of justice. Yet complete justice and liberation will come when the masses of the world overturn this system of exploitation and create one that serves the people. The Mau Mau rebellion was one where colonized people stood up and fought back against imperialist exploitation, and in turn where the colonizers conducted terror against the colonized to put it down. Overall nothing will stop the spirit of liberation that the peoples of the world have and will build on. The struggle is ongoing until victory.